Notre Dame University South Bend Indiana Jo Travels Around the U.S. Road Trips! I decided to take a road trip to see Notre Dame. I had always heard how beautiful the campus is, but I'd never been there. Since South Bend is only a little over 2 hours from where I live in Chicago. I called a friend and we were off to see Notre Dame! We stayed at the Comfort Suites just up the road from the University. Very nice hotel... except there was a party going on all around us and there wasn't much sleep that night. Two tips on hotels in South Bend.. if you go when anything is going on at the University, the hotels are full of partying students, and if you go there when there is any kind of sports event happening, the hotel rates are double the normal price. We originally booked the night at the Days Inn in Mishawaka cause the price was reasonable (it's just east of South Bend) but the place was horrid. We took one look at the room and left. Don't be fooled by their ads, Days Inns are usually very good, but this one is a hole. 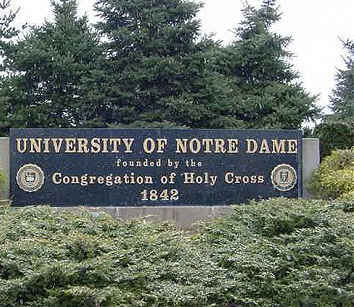 Notre Dame University in South Bend Indiana was founded in 1842 by Rev. Edward Sorin and French priests who were members of the Congregation of Holy Cross. While the translation of Notre Dame du Lac is "Our Lady of the Lake", the university actually has two lakes on its campus. According to legend, when Father Sorin arrived to found the school, it was November and everything was frozen. He thought there was only one lake, and named the university accordingly. This beautiful mural, refered to as "Touchdown Jesus", is painted on the Hesburgh Library. It can be seen over the south end zone of Notre Dame Stadium during games. These two buildings are the center of sports at Notre Dame. Before kickoff the Notre Dame players enter the field down a set of stairs past a large sign that reads "Play Like A Champion". Text on statue reads: Coach Frank Leahy, 1908 - 1973 This sculpture was presented to the University of Notre Dame on Sept. 19, 1997 by his former players, the Leahy family, ND alumni and his many admirers. The Fighting Irish have given the sport its most famous coach, Knute Rockne "Win one for the Gipper". During Rockne's 13-year coaching tenure here, the Irish won six national championships, the 1925 Rose Bowl, and had five unbeaten and untied seasons. The golden dome on the main building of Notre Dame University, with its statue of the Virgin Mary, defines Notre Dame's skyline and its Catholic character. The gold dome can be seen from all over the University campus, and surrounding area in South Bend. It truely is a beautiful campus.. It's a pretty nice place to visit and spend a weekend.